BLOODBOUND, the Swedish melodic, heavy metal band featuring members from STREET TALK, TAD MOROSE, MORGANA LEFAYand PYRAMAZE, have signed a worldwide deal with BLISTERING RECORDS. The band’s third album “Tabula Rasa” will be released by BLISTERING RECORDS in early 2009. The band has kept busy since their inception in 2004, having released two previous albums Nosferatu (2006) and Book Of The Dead (2007), and played numerous shows across Europe with the likes of HammerFall, Arch Enemy, Dark Tranquillity, Evergrey and Pretty Maids. In regards to the band name, the term ‘bloodbound’ originated during the dark ages referring to an oath between men wherein they would cut their own hands and clasp thereby mixing their blood. Each man then carries the other’s blood, linking the two, as blood brothers. A bloodbound can never be broken and will follow you into the afterlife and beyond. In the summer of 2004 the two long-time friends Tomas Olsson and Fredrik Bergh decided to go back to their musical roots and start a metal band, they formed BLOODBOUND. A demo was made and shipped off to a bunch of record labels around the world in order to get a record-deal. After a couple of weeks the offers started to drop in and the band was overwhelmed by the great response they had gotten. A record-deal was signed with Metal Heaven for the European territory and with Marquee/Avalon for the Asian territory. In 2005 they started the recordings of their debut album “Nosferatu” which was released in early 2006, and became a big success with top reviews around the world. The album took them on tour playing gigs with bands like Arch Enemy, Dark Tranquillity, Evergrey, Pretty Maids and Sabaton to name a few. The success of the album also gave them a license deal with Rock Machine Records, Brazil and Mystic Empire, Russia later that year. 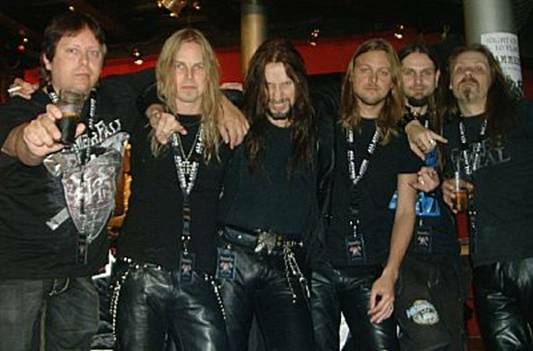 During the 2006 tour they had some “in and out members” including Kristian Andren (Wuthering Heights, Memento Mori, Tad Morose), Johan Sohlberg (The Storyteller), Jorgen Andersson (Baltimoore) and Markus Albertson (Seven Sins). At the end of the tour Urban Breed decided to leave the band to focus a 100% on his long planned solo project. After a very turbulent and hectic year they really felt that they needed some stability in the band and asked Tomas’ younger brother Henrik Olsson (guitar) and Johan Sohlberg (bass) to join the band as permanent members. This was at the end of the summer of 2006. They accepted and the band started to work on their second studio album “Book of the Dead”. The spot as BLOODBOUND’s new lead singer was not yet filled and it took the band a while to find a worthy replacement. After a lot of searching and auditioning the band finally decided to go with German born Michael Bormann (Jaded Heart, Bonfire) who joined the band in early January 2007. The album “Book of the Dead” was recorded during January and February 2007 and was released on May 25th, 2007. Book of The Dead was a big success and the band even charted in the official Swedish top 100 album chart at #66! Shortly after the release of “Book of the Dead” the band realized that with Michael’s busy schedule it would be impossible to do all the live shows coming up. Urban Breed was asked to stand in and ended up doing all the shows for the tour, and eventually got back with the band as a permanent member! The word of the band had by now started to spread big time and the new album got them on tour with Hammerfall on their “Nights of Glory” European tour and the HammerFall Ocean Crusade in 2007, which gave them the opportunity to play for a bigger crowd. Joacim Cans, the singer of HammerFall was deeply impressed with the band and stated in magazine interviews that if HammerFall ever split up the band he wanted to sing in the most were BLOODBOUND! 2007 also led to playing bigger festivals such as the Sweden Rock Festival. At the end of 2007 the band started to work on their third studio album. While working on the third album the band played at several big festivals during the summer of 2008, one of the highlights in the career of the band was their gig at Masters of Rock in Czech republic in front of 20,000 crazy metal heads! At the end of 2008 the band signed a worldwide deal with Blistering Records. The recordings of the third album “Tabula Rasa” took place in several studios during November and December 2008. The album will be released in the spring of 2009 via BLISTERING RECORDS.